Outside one of the most luxurious residences in Delhi's embassy district, an elderly man waters the dusty driveway. A short rickshaw journey and people are fighting to get enough drinking water. It is 45 degrees Celsius. Every day, water has to be delivered to the people living in the outer parts of Delhi. Millions living in these slums don't have access to water and sanitation services as the groundwater table is depleted. "These areas have been populated 20-25 years. There has never been enough water here, but the water shortage is a growing problem," says Kamal Gupta who works for the local organisation FORCE, supported by Water Aid. Every year around 350,000 people arrive in Delhi from other parts of India in hope for a better future, some forced from there land as crops fail. Fast pace population growth, combined with a warmer climate and severe drought has led to widespread water shortages in India’s capital. "They blame it on us, we are already starving," says Rajesh Kumar, who came to Delhi from the impoverished neighbouring state Uttar Pradesh 20 years ago. If they counted water per head it would be fairer." He shows us around his home district, the Dalit Ekta Camp located in south Delhi. Outside Rajesh Kumar's house stand several empty jerry cans. "We are totally dependent on the water trucks. For the last five years the well has been empty. Previously there was water for two months of the year from rainfall at least," he says. Outside one of the tattered houses we meet another resident Sonia Devi. 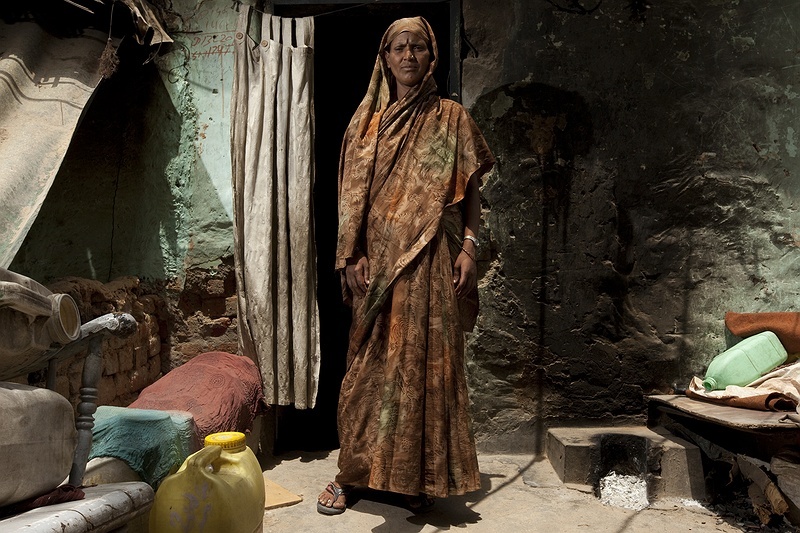 She lives here with her husband and four children in a ten square metre room with no toilet. "The biggest problem is sanitation and hygiene; there is not enough water to keep ourselves clean. We have to walk kilometres just to go to the bathroom sometimes. It is like being mentally harassed," she says. 30 percent of Delhi's population lives in slums. Technically many of these settlements are illegal, therefore there is no investment into facilities. Self appointed Cluster leaders take advantage of their illegal status by dominating the water supply and making profit from other peoples plight. We leave Sonia Devi and Rajesh Kumar and take a rickshaw to Israel Camp, another rural cluster in south Delhi. Here the cluster ‘big boss’ man known as Pradhan has made water shortage a source of income for himself. "We are forced to pay 150 rupees (about 2,6 euros) to fill water for 20 minutes. People are afraid to speak up as the land is owned by the Forest department who are friends with Pradhan," adds a woman unwilling to say her surname for fear of repercussions. The organisation FORCE work with water related issues in Delhi and have problems helping the people in Israel Camp due to this absurd situation. "We recently put out 40 restrooms just outside the area to improve the sanitation situation, but there are many cases like Pradhan" says Krishna Kumar Tiwari who works for FORCE. We head north to the slums on the other side of the city. A gruelling hour-long rickshaw journey in 45 degrees Celsius keeps water on the mind. "See these children's faces," says Jasvinder Kaur as she grabs a small child. The girl's face is full of black reddening bumps that look like her face is bubbling with a severe black acne. "They have been playing with the contaminated water from the taps in the street." Since FORCE placed water silos in the area the chaos around water supplies has calmed a little. "Earlier there was often panic because they were afraid they wouldn't get enough," says Jasvinder. Shiva Nand is one of the better examples of dealing with a worsening situation in Delhi. Recently FORCE and the local community installed a water collection system in the grounds of a nearby school. "Wealthier people waste water. They have swimming pools, air coolers and flush their toilets. Water is essential to all human survival. I am very tired of telling poor people to save water, when it is mainly the rich that should," says Jasvinder Kaur.